In Margo's Magnificent Choice by Christ Kent Phelps and Cindy Kent, Margo is a beautiful monkey that overhears a few things and doesn't understand how words hurt people. After a few conversations and upset friends, she finds a very wise Owl. Mr. Owl teaches her about Tacky Box. He tells her, "It will hold all the tacky, unkind words you might say or hear. Simply write the tacky word on a piece of paper and place it in the box. Make the choice to remove it from your mind and from your heart forever. I know you can do it!" You'll have to read the book to find out how it ends, but I will tell you that Margo uses her Tacky Box and we had smiles on our faces. Check out the original review for Tacky Box by Sweet Cheeks and Savings HERE. Dates: Starts March 10, 2014 12:00 am EST. Winner will be chosen March 24, 2014 11:59 pm EST. 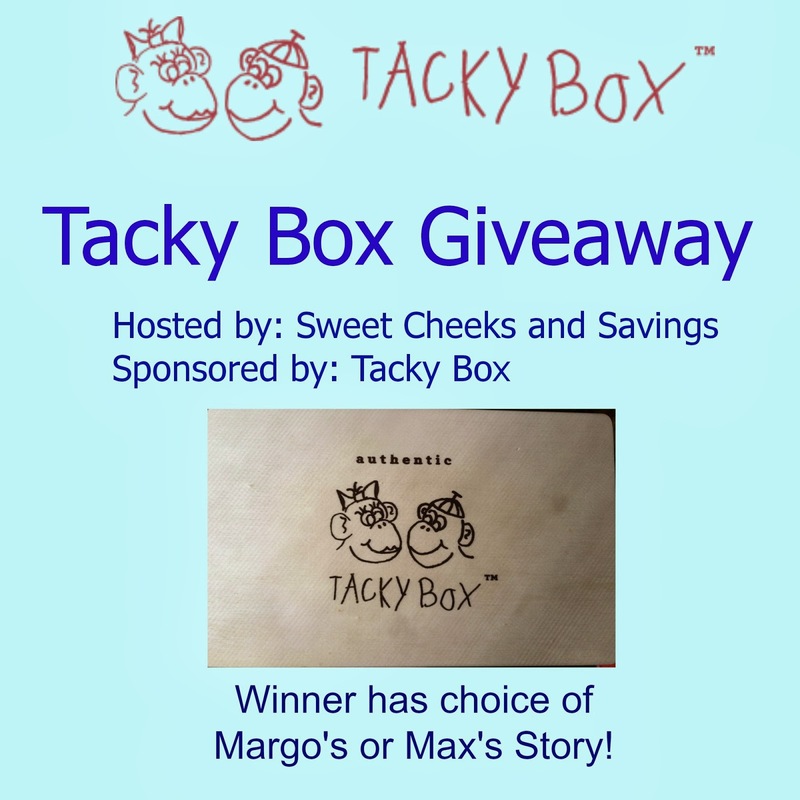 Disclosure: Sweet Cheeks and Savings teamed up with Tacky Box for this giveaway. Other participating bloggers are not responsible for choosing the winner or shipment of product. They have not receive any compensation for this post. My son started repeating my tacky words. Lesson learned. My son also starting repeating EVERYTHING I say. Some things are not so cute coming out of the mouth of a three year old! I'm trying to get my grandson not to say fart..and of course his sister said it! I have a very similar story with my 5 yr old... The situation made me cry a little, but now looking back it was rather funny!